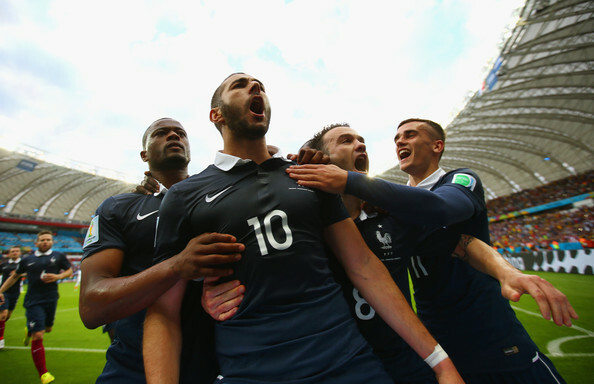 Can France & Karim Benzema Win the 2014 World Cup? So is one big win enough to convince you that France are now among the favorites to win the World Cup? In truth they always were in the mix, although a bit pushed to the back of the line. But with Karim Benzema in this kind of scoring form and overall looking very solid all over the pitch with a dominant opening match victory, why not consider France as an option for the 2014 World Cup champions? There’s a long version and a short version. The most accurate answer would be hold on to your horses. France did manage to look very good for most of the match against Honduras, with or without the one player advantage. They finished with 3-0 win, hitting the crossbar or post three more times and never once looking worried about the chances of walking away with the comfortable win. However, this was the Honduras national football team we are talking about. A team without a single creative player, and a team that defends with 11 men on the pitch. This Honduras team lost to Israel 4-2 a couple of weeks before the tournament. While friendly matches aren’t the best indicator, this was definitely a warning sign that Honduras aren’t going to achieve something new in this World Cup. And then there’s Karim Benzema, with two goals and very close to a hat trick. He is in the prime of his career and looking a lot more comfortable with leading the French attack, even if it sometimes means playing in a wider role and not as a classic target man, which he wants to do but isn’t as useful when occupying that role. This isn’t the player that will decide how far France goes. He’s part of that equation, and he has a good shot of being the top scorer when this tournament ends. But France’s ability to move the ball quickly from their midfield to the front line will be more important. So what to make of France demolishing Honduras? That this team isn’t about to make a mockery of itself like the 2008 and 2010 versions. Despite having Patrice Evra on the team, the social situation is good, and we’re not going to see this side under Didier Deschamp implode. There aren’t any superstars now that Franck Ribery isn’t playing, but there are no players to tear the social fabric in the dressing room (Samir Nasri, ahem ahem). France remain one of those outside favorties that people should be taking seriously, but also still coming in behind more realistic trophy lifters, which right now seem to be Brazil and Argentina. Forget about the ability in the first game, which often doesn’t tell the whole story. Some teams need time coming together through and during a tournament. France were lucky enough to get a very comfortable landing in Brazil.